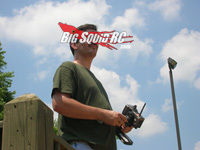 ASK Cub Reporter, 05.16.2013, Version- Legit Questions, Snotty Answers « Big Squid RC – RC Car and Truck News, Reviews, Videos, and More! Cubby – First off I would like to add some info/data to the answer I gave Dave B in last weeks ASK Cubby. Dave’s email basically said that “C” ratings on Lipo batteries seem to be a bit shady, and well, you need to read LAST WEEKS COLUMN to see how I replied. A bit over a year we reviewed a Zeus 3S 850 mah Lipo pack. Our West Mountain CBA is fully capable of testing a pack of that size to its stated “C” rating, so of course we did just that. The pack was rated at 25C, which is 21.25 amps, and after testing the pack lived under that load. At 25C the pack exhibited a big horseshoe in the discharge curve, meaning it was being pushed to its limit, but otherwise it didn’t get too hot and lived to fight another day. If anyone out there is looking for proof that not everyone lies about their “C” ratings, the Zeus pack we tested would make a good example. IMO a 25C continuous rating on that pack was in the ballpark, I would have considered it a rock solid 25C pack if there was no horseshoe in the discharge curve. When we dialed up the discharge rate to 30C (25.5 amps) the pack couldn’t take the load and dropped below 3 volts per cell immediately. HERE is the link for the review (with full graphs) that I am talking about. But… a small capacity pack with a low “C” rating isn’t exactly what Dave was complaining about, so this week I broke out the West Mountain again. Yes, we’ve connected big loads to packs before, but we’ve never connected a big continuous load in a more controlled setting with the CBA. I took half of a 5000 mah 55C saddle pack and decided to go big with it, our West Mountain tops out at 120 amps continuous on a 1S/4.2 volt battery. So… what happened to our 1S 5000 55C Lipo under 120 amps continuous? It wasn’t good, LOL. The voltage immediately dipped below the 3 volt cut-off. By immediately I mean in less than 5 seconds. The curve looked like a cliff, the voltage went straight down to below the 3 volt cut-off. Also of note… I wired up the pack like it would be used in the real world, with 12 gauge wire and a Traxxas connector. The Traxxas connector got mildly warm, but the wire got straight up HOT (and I have a blister on one of my fingers to prove it). We knew the wiring was going to be the weak link in advance and our testing simply proved it. I then backed off the discharge to 100 amps with pretty much the same end result. Finally I dropped the load down to 80 amps where the pack behaved in a more “normal” manner, except the wire was still getting hot. The voltage dipped hard under 80 amps, but not below the cut-off value, and the battery itself stayed at a relatively low temp throughout the entire discharge. I am going to re-do the test later this week, this time with heavier wire and post the graphs in next weeks ASK Cubby. Is 120 amps continuous too much for the cells in a 5000 mah 55C Lipo or are they more than up to the task given heavy enough wiring? More info next week on this one. I have a brand new Slash, what is the first mod I should do? I was thinking a brushless system but don’t know what is a good brand. Cubby– Yo what’s up Emilio, thanks for the email and mad props for the super easy question. I have a very clear cut first mod on the Traxxas Slash– new hinge pins. The stockers are made out of butter and like to work their way loose. Uber hinge pins are a relatively affordable mod that makes the truck more durable, easier to work on, and can improve the way it drives. They don’t add to the bling factor, but good hinge pins won’t bend and won’t back out, making them worth their weight in gold. I’ve used two different brands- Pro-Line and ST racing Concepts. The Pro-Line Set runs about $22 and are super easy to install. The STRC set sells for $18 and I’ve also had good luck with them. Both sets can also take a pretty intense beating. You can barely tap a pipe and bend the stockers while after slamming a cement curb the aftermarket pins remain straight as an arrow. Pick a set and install’em, you’ll be thanking me later. The next hop-up/mod I would recommend wouldn’t be a brushless system either, it would be a good Lipo battery. Not only will a good Lipo give you more power and run-time, but having an extra battery around comes in really handy. Check out one a 2S Venom 5000 mah pack, they have good performance, don’t break the bank, and are readily available from most hobby shops. That’s it for this weeks “ASK Cubby”, send your emails to Cubby at BigSquidRC.com. All letters that hit the big-time get a free sticker pack while the one I proclaim as “letter of the month” gets a free BSRC t-shirt.